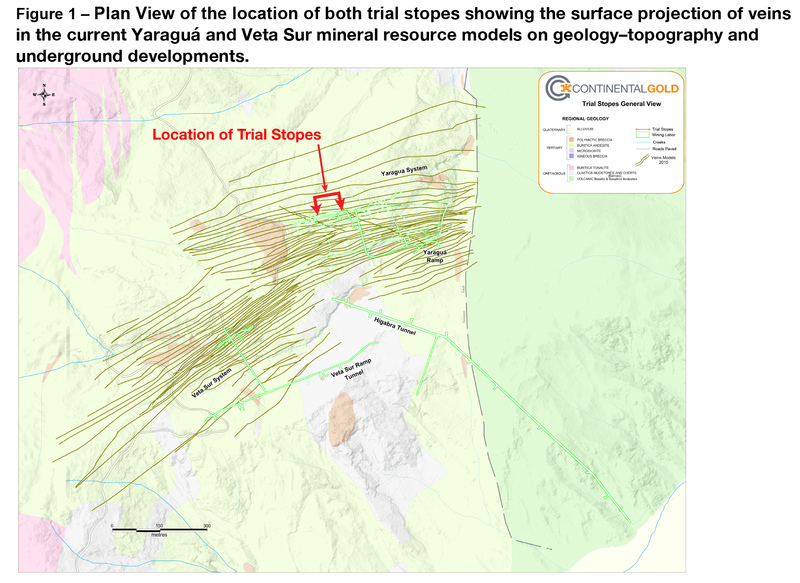 TORONTO, ON--(Marketwired - February 04, 2016) - Continental Gold Inc. (TSX: CNL) (OTCQX: CGOOF) ("Continental" or the "Company") is pleased to announce channel sampling results from a new sublevel drift located below two trial stopes that the Company has extracted using long-hole mining in the Yaraguá vein system at the Company's 100%-owned Buriticá project in Antioquia, Colombia. JDS Energy & Mining Inc. was retained to plan and oversee trial mining and material handling protocols. Stopes were designed based on the orientation and width of the San Antonio vein, as outlined in the most recent mineral resource block model for the Yaraguá deposit prepared in accordance with Canadian National Instrument 43-101 ("NI 43-101"). The initial east stope design measured 11 metres drill height by 17 metres long by 1.8 metres wide, while the west stope measured 11 metres drill height by 12 metres long by 1.8 metres wide. The 1.8-metre width was determined by adding 0.3 metres of over-break dilution to either side of the 1.2-metre-wide San Antonio vein. * Channel samples are taken across the roof of the underground drift and are spaced every one metre along the strike length. "As we have seen time and time again at Buriticá, vein widths and precious metal grades tend to improve with increased sample density due primarily to unmodelled gold bearing veinlets intersecting master veins at various orientations," commented Ari Sussman, CEO. "We are presently running material from both mined out stopes through our small-scale processing facility and will report final reconciled results towards the end of Q1 2016." "Continental's first mechanized long-hole trial mining test has provided very valuable experience for our operations and technical teams", commented Donald Gray, COO. "Not only has dilution proven to be well within expected ranges for these initial trial stopes, but the test mining results we have experienced to date have continued to validate our confidence that the long-hole method will be well suited for Buriticá's vein systems." Certain technical information in this press release is based upon information prepared by Austin Hitchins, P.Geo of JDS Energy & Mining Inc., a Qualified Person (as defined in the Canadian Institute of Mining, Metallurgy and Petroleum Standards on Mineral Resources and Reserves and NI 43-101) and independent of Continental. 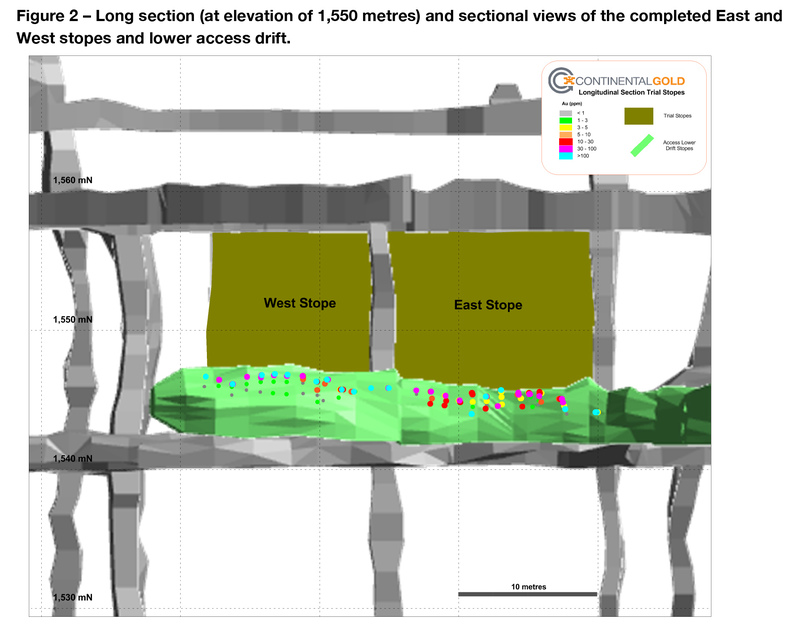 For additional information on the Buriticá project, please refer to the technical report, prepared in accordance with NI 43-101, entitled "Independent Technical Report and Resource Estimate on the Buriticá Gold Project 2015" and dated August 7, 2015 with an effective date of May 11, 2015, led by independent consultants Mining Associates Limited. The technical report is available on SEDAR at www.sedar.com, on the OTCQX at www.otcmarkets.com and on the Company website at www.continentalgold.com. Continental Gold Inc. is an advanced-stage exploration and development company with an extensive portfolio of 100%-owned gold projects in Colombia. Formed in April 2007, the Company -- led by an international management team with a successful track record of discovering and developing large high-grade gold deposits in Latin America -- is focused on advancing its high-grade Buriticá gold project to production. On June 24, 2015, the Company announced an updated mineral resource estimate for the Buriticá project, prepared in accordance with Canadian National Instrument 43-101, based on 271,003 metres of drilling and sampling (as at May 11, 2015). This estimate covers the Yaraguá and Veta Sur vein systems, with a combined Measured mineral resource of 0.89 million tonnes of mineralized material containing 0.54 million ounces of gold grading 19 g/t gold, 1.58 million ounces of silver grading 55 g/t silver, and 13.4 million pounds of zinc grading 0.7% zinc, and a combined Indicated mineral resource of 12 million tonnes of mineralized material containing 3.94 million ounces of gold grading 10.2 g/t gold, 12.4 million ounces of silver grading 32 g/t silver, and 112.6 million pounds of zinc grading 0.4% zinc. The combined Inferred mineral resource is 15.6 million tonnes of mineralized material containing 4.5 million ounces grading 9.0 g/t gold, 14.7 million ounces of silver grading 29 g/t silver and 91 million pounds of zinc grading 0.3% zinc. The Buriticá project contains several known areas of high-grade gold and silver mineralization, of base metal carbonate-style ("Stage I") variably overprinted by texturally and chemically distinctive high-grade ("Stage II") mineralization. The two most extensively explored of these areas (the Yaraguá and Veta Sur systems) are central to this land package. The Yaraguá system has been drill-outlined along 1,100 metres of strike and 1,700 vertical metres and partially sampled in extensive underground developments. The Veta Sur system has been drill-outlined along 1,000+ metres of strike and 1,800 vertical metres and has been partially sampled in underground developments. Both systems are characterized by multiple, steeply-dipping veins and broader, more disseminated mineralization and both remain open at depth and along strike, at high grades. JDS Energy & Mining Inc. is a Vancouver-based mining consulting company with extensive experience in mining and development studies. JDS has assembled a multi-disciplinary international team of experts to conduct a feasibility study for the Buriticá project. Figure 1 - Plan View of the location of both trial st opes showing the surface projection of veins in the current Yaraguá and Veta Sur mineral resource models on geology-topography and underground developments. Figure 2 - Long section (at elevation of 1,550 metres) and sectional views of the completed East and West stopes and lower access drift. 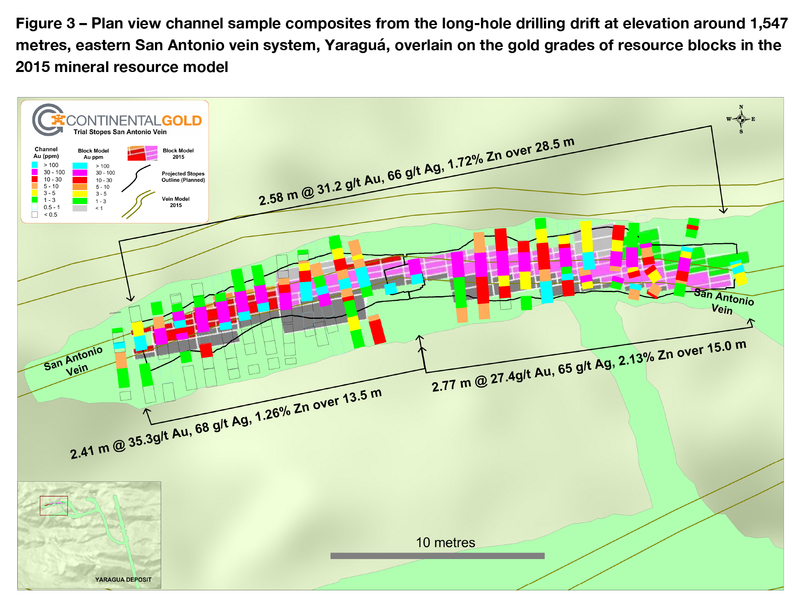 Figure 3 - Plan view channel sample composites from the long-hole drilling drift at elevation around 1,547 metres, eastern San Antonio vein system, Yaraguá, overlain on the gold grades of resource blocks in the 2015 mineral resource model.